Below are some very interesting historycal documents to be viewed. A real life footage of the REFORMASI movements and police brutallity. Talks by political leaders and MORE! From cassettes, video tapes and vcds. Worth buying and watching! You could get all these goodies and more at Masjid Jamek, K.L and at any ceramah organised by the B.A. Get a chance to look at what's happening inside the home and the lives of Anwar Ibrahim's family after the tragic arrest! Interviews with Nurul Izzah! A collection of Anwar Ibrahim's speaches, suspense moment of 'the' arrest, police brutallity and the rise of the people! More collections of Anwar Ibrahim and other political leader 's speaches, police brutallity, the rise of the people and more! The conspiracy of Anwar Ibrahim revealed, the tragedy of 14 April 1999, more police brutallity and the rise of the people! 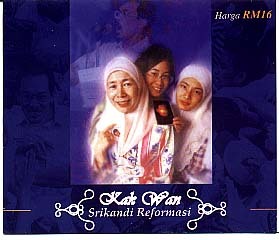 The pelancaran of Parti Keadilan Nasional (keADILan) on the 4th April, 1999 at the Renaissance hotel, Kuala Lumpur.